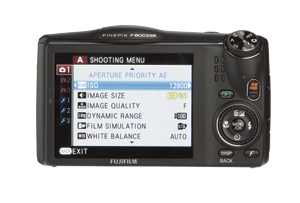 The FinePix F800EXR is well built and easily fits into a pocket or small bag, making it convenient to carry at all times. The lens is a three-section telescopic type, which extends to about 11⁄2in, and it retracts into the camera when turned off. The shutter release is placed at a slight angle to the top-plate, which makes it comfortable to use, while the mode dial is also angled, with clearly marked settings. For the casual user there are perhaps too many modes and menu options, although the program, auto and EXR modes can be used with confidence for most shots.